Cities Service Company was formed in September 1910 by Henry Latham Doherty as a public utility holding company in Bartlesville, Oklahoma. As astute businessman, Doherty bought natural gas producing properties in Kansas and Oklahoma. He acquired distributing companies and linked them to natural gas supplies. His company derived income from the subsidiary corporations’ stock dividends. Jack & Al’s Cities Service Station in Key West, Florida, in 1965. Photo courtesy Monroe County Public Library. On October 5, 1915, in central Kansas, Cities Service’s Wichita Natural Gas Company discovered the 34-square-mile El Dorado oilfield. As oil and natural gas holdings expanded in the Mid-Continent, the company added the Empire Gas & Fuel Company of Bartlesville, Oklahoma. In 1928, Empire Oil & Refining, the Cities Service subsidiary, discovered the Oklahoma City oilfield. Production also came from the Greater Seminole oilfield, discovered two years earlier. Drilled in July 1926 near Seminole, the Fixico No. 1 well revealed the prolific Wilcox sands at 4,073 feet and launched a drilling boom rivaling those in Texas. Learn more in Greater Seminole Oil Boom. Over the next decade more than 60 petroleum reservoirs were found in 1,300 square miles of east-central Oklahoma – and seven were “giants,” producing more than million barrels of oil each. A March 1930 a well hit a high-pressure formation about 6,500 feet beneath the state capital, Oklahoma City. A geyser of oil erupted – and flowed skyward for 11 days. The Oklahoma City oilfield discovery well soon became an international sensation. Learn more in World Famous Wild Mary Sudik. Federal court mandates in 1940 (a result of the Public Utility Holding Company Act of 1935) resulted in Cities Service Company’s divestiture of its public utilities. In 1959 the remaining oil and natural gas companies were reformed as Cities Service Oil Company. In 1964, Cities Service changed its marketing brand by introducing the name CITGO – keeping the first syllable of its name and ending with GO to imply power, notes the company CITGO website. When T. Boone Pickens’ Mesa Petroleum tried a hostile takeover, Cities Service resisted and counter-offered. Gulf Oil Company made a “White Knight” merger offer, but 20 years of litigation ensued. Occidental Petroleum ultimately acquired Cities Service on December 3, 1982. Under the terms of the purchase agreement, Cities Service stockholders were entitled to exchange each Cities Service share for .41 of a share of $15.50 cumulative preferred stock of Occidental and the right to receive one or more zero coupon notes. A year later, Occidental sold the entire Refining, Marketing and Transportation Division of Cities Service to Sounthland as well as the CITGO brand to Southland Corporation, owner of 7-Eleven stores. A company historian notes that in 1986 Petróleos de Venezuela, the national oil company of the Bolivarian Republic of Venezuela, puchased 50 percent of CITGO. The remainder of the company, today based in Houston, was acquired by Petróleos de Venezuela in 1990. 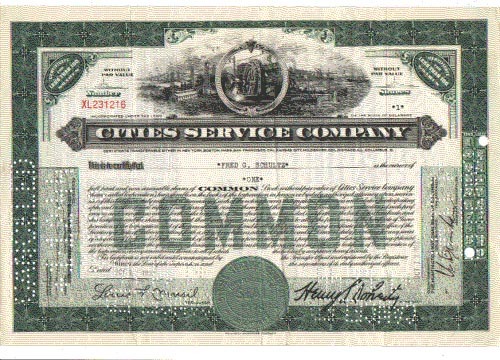 Cities Service stock certificates that are perforated or otherwise cancelled have only collectible value. Others have been canceled on the books and the underlying value turned over to state unclaimed property divisions.